A team of French designers and engineers are currently building an electronic version of their pedal-powered personal wet sub. 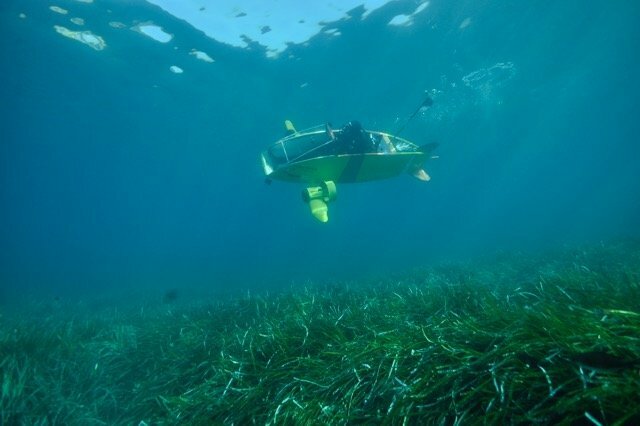 Many groups have taken a stab at designing recreational submersibles, but the Scubster already has a real, working pedal model that allows the driver to literally “bike” underwater. The driver still has to wear scuba gear. Your head sticks out like a mini-underwater bi-plane. And if the Scubster design has the look of James Bond’s yellow submarine seen in “The Spy Who Loved Me” it also is as quiet, and can run in stealthy silence. The new electric model is called the Nemo, and has been in development since 2011. Designers believe the electric model will be a great fit as a working tool for marine scientists, coast guard patrols, and even for groups like diving clubs looking to explore the water at a leisurely pace. The Nemo prototype has a prop on each side and seems to be highly maneuverable because those props are controlled using a lever coupled to a bar, so each can be independently rotated. What a great way to take your scuba diving to new heights. Two electric motors give it a top speed of about 5 miles per hour, but could be replaced if more power is needed. The installed battery packs are good for about two hours between charges, although the development team is working to increase them to five hours. The Nemo costs about $16,500 to build, but you can’t actually own one yet. Backers are being asked to support the project through a Kickstarter venture as it moves toward commercial availability. The promise of a 30-minute Scubster Nemo pilot instruction session at a depth of 33 feet as their reward comes with a pledge of $165. Profits from this Kickstarter campaign – which runs through October 6 – will be used to make improvements to the prototype before production begins. In 2011, the original Scubster took part in the International Submarine Race at the Naval Service Warfare Center in the United States and snagged an Innovation Award. The Scubster is an almost 14-foot long submersible designed to seat a single individual. The original had a watertight cabin but the latest just incorporates a transparent acrylic shield. The sub doesn’t have a built-in oxygen system, so you’ll have to go down with your own supply.